It doesn't happen very often in FL, but it's been pretty cold recently... cold enough that comfort food has become very appealing. Usually, comfort food comes with a lot of wheat so coming up with tasty substitutes is a must. 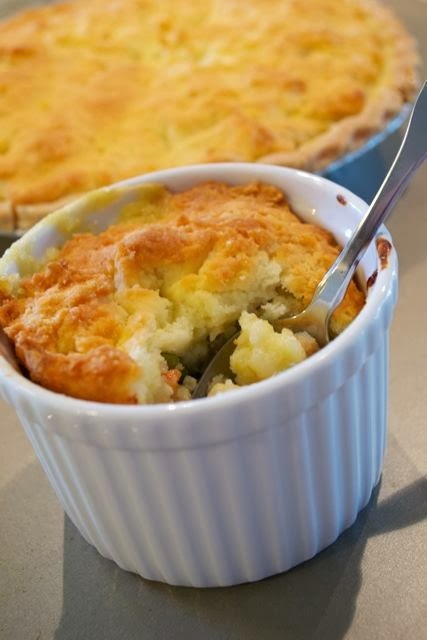 This chicken pot pie really hits the spot, especially because it's super easy to make! 3. When the broth has just reached a boil reduce the heat to medium low and simmer for 15 minutes or until the carrots are just tender, remove from heat, drain the broth into a separate container and pour the chicken/vegetable mixture into a bowl. 4. In the same saucepan over medium heat, cook onions and garlic in butter until soft and translucent. Stir in corn starch, salt, and pepper. Slowly stir in 1 ¾ cups of the reserved chicken broth and cream. Simmer over medium-low heat until thick. Remove from heat. Pour the chicken/vegetable mixture into the broth mixture and add the chives. Stir well and add salt and pepper to taste. 5. Prepare the Bisquick biscuit dough as directed on the box. Fill the pie crust with the filling and fill greased ramekins with any left overs. Cover the filling with the biscuit dough. Place the pie and ramekins on a baking sheet and cook everything for 50 min or until the tops are golden brown and the edges are bubbly.